However early we get up , the mornings in our house are always manic. If it’s not trying to get out the door to do the school run it’s running down the road to football practice on a Saturday morning. Someone’s shoe always goes missing or jam gets spilt on a freshly washed shirt.So with all the dashing about what I am going to wear tends to be the last thing on my mind. I do generally live in jeans and t-shirt combo but now the weather is getting warmer I was in need of something a little cooler.I was introduced to the brand Me&I by a friend who attended one of their at home parties. They are a Swedish company started by Susan Engvall and Helene Nyrell from the kitchen table in their homes in Barsebäck, Southern Sweden. The specialise in unique designs that are affordable and practical.I decided to take a look at their website and through talking to a local consultant they offered me to pick a couple of things to review. 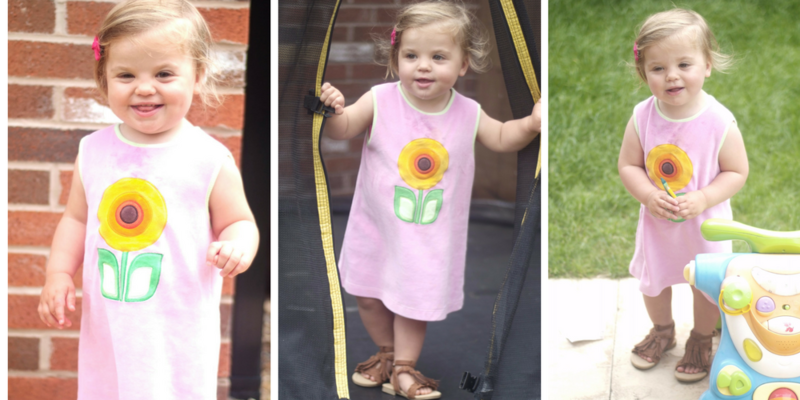 I loved the look of the Striped Everyday Dress for me and choose the Tunic With Circle Flower for Charley. What I love about tunics for both me & Charley are there is only 1 item to put on in the morning ( as well as knickers ) so it speeds up the dressing process and on cooler days a pair of leggings can be added. Practicality for both me and Charley is our clothes need to be hard-wearing, comfy and washable. We are still in the stage of Charley getting 1/2 her lunch down her top and the other 1/2 down mine so clothes need to withstand daily 30 degrees washes. Mine and Charley’s days are filled with running about and playing so clothes have to be able to move with us and be a good length so not to expose anything unnecessary. The Striped Everyday dress is made of a lovely stretchy cotton and being knee-length even if I have to kneel down to help Charley I am not worried I will flash my knickers to the neighbours. I love the pocket details which come in handy for storing hair bobbles and emergency dummies. The dress is very practical as I could move about in it freely and as lovely as it looked with a pair of Converse & a denim jacket it could be jazzed up for a casual evening out with heels and a leather jacket. I liked the bold stripes and after 5 washes the colours are still bright and the fabric has kept its shape. I loved Charley’s Tunic With Circle Flower as soon as I saw it on the internet. The style was very European and not like anything I had seen on the high street. Charley is not a partially girly girl and loves nothing more than playing with Harry’s digger in the mud but with our holiday to Tenerife coming up I wanted to get her a nice summery dress to keep her cool. On the day of modelling, Charley was not for standing still and enjoyed a good run around the garden, bounce on the trampoline and play on her scooter. The tunic didn’t restrict any of her activities and unlike some days when she is pulling at an uncomfortable pair of jeans or jumper, she was more than happy to model her dress. I am highly impressed with both of our tunics from Me&I and certainly be ordering more items for our upcoming holiday. The quality is really good and the fit and style are very flattering. The items can be purchased online or through your local Me&I consultant. I hope you have enjoyed my review today. If you have ever purchased anything from Me&I let me know what you think in the comments below.